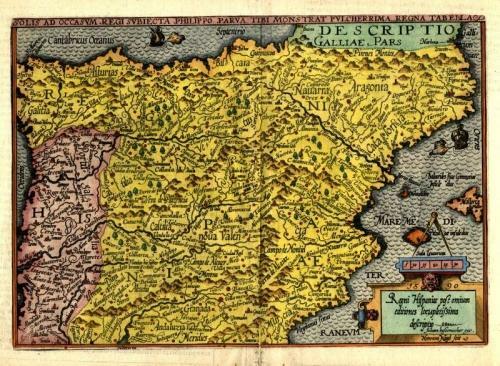 A handsome map of Spain and Portugal that was probably based on Ortelius. The map covers most of the Iberian peninsula except the southern coastline. Quad's has a bold style and here depicts the topography and forests in great detail and in rich colour. The map is decorated with ships and a strapwork title cartouche. There is an old paper repair on the fold and a short tear in the lower left blank margin. Generally in very good condition.